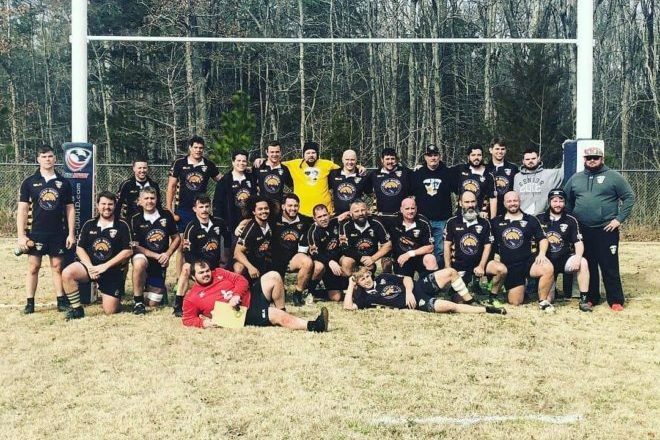 MINT HILL, NC – After a week of unseasonably warm weather in the Carolinas, the temperatures dipped back down just in time for the Clayton RFC to travel to the Charlotte area for a big Saturday rugby doubleheader. Despite the nip in the air, the skies were clear, and it was a beautiful day for rugby. Hosted at Rocky River High School by the new R3 Rugby Club, the Bootleggers 1st XV faced off against the Charlotte Barbarians and the 2nd XV took on Gaston County in a friendly match. The match with the Barbarians came with playoff implications as the two sides sat near the top of the Carolinas Division 3 standings and separated by only one point on the table. Charlotte got off to a great start as they crossed over for a try on a long run by their flyhalf in the 3rd minute. The Bootleggers maintained pressure deep in the Barbarians half for the next 10-15 minutes of play. The visitors had a few good scoring opportunities that were turned away by the Barbarians defense. It wasn’t until the 21st minute that the Bootleggers crossed over when Cam Grim scored in the corner to knot the score at 5-5. Charlotte answered right back with another try in the 24th minute on another long run from one of their backline players. The match took another turn in favor of the home side when Clayton’s Trey Eason was red carded in the 30th minute for a high tackle. Down to 14 men, the Bootleggers buckled down and took the lead just before halftime when center Austin Lyons crossed over for a score. Ed Dixon added the conversion to give the Bootleggers a 12-10 lead as the first half came to a close. The Barbarians regained the lead in the 50th minute with a strong run from one of their forwards. The conversion gave them a 17-12 lead. Clayton flanker Eric Davis stole the restart and the Bootleggers pushed into the Barbarians’ 22. Flyhalf Brian Beauregard found a seam and went over for a try to tie the match at 17-17. Minutes later the Bootleggers were back into the Barbarians’ 22 with Eric Davis going over for another try. The conversion from Dixon gave Clayton a 24-17 lead as the match moved into the final quarter of play. After a series of penalties, the Bootleggers extended their lead to 27-17 when Dixon slotted a penalty from in front of the posts. Charlotte answered right back with a 63rd minute try to cut the lead to 27-22. Another Dixon penalty goal in the 65th minute extended the Bootleggers’ lead to 30-22, but Charlotte once again answered right back. The added another try to cut the lead to 30-27 as the match entered the final ten minutes of play. Clayton seemed to put the match away when a perfectly placed kick from Beauregard was gathered by Grim who crossed over for his second try of the match. Beauregard added the conversion to give the Bootleggers a 37-27 lead with just minutes to play. The Barbarians weren’t finished and added one last converted try before the match came to a close with the Bootleggers victorious by a score of 37-34. The win was a boost for Clayton’s playoff hopes as the win pushes them into a tie with Columbia for 1st place in the Carolinas D3 standings. With the first match out of the way, the club’s 2nd XV took the pitch against Gaston County. The two sides produced an entertaining matchup and another seesaw battle for fans to enjoy. Gaston County was first on the scoreboard with an early try. The Bootleggers answered back with a try on a nice run from wing Dusty Doyle, who was playing in his first-ever rugby match. Ed Dixon added the conversion to give the 2nds a 7-5 lead. Midway through the first half, Gaston retook the lead with another short range try from their forward pack. The conversion put the lead back in favor of Gaston County 12-7. Just before halftime, Clayton knotted the score with a kick chase score from Jeremy Doyle, also playing in his first-ever match. That left the score tied at 12-12 as the teams entered the half. Gaston retook the lead just after the half to and added a conversion to place the score at 19-12. The two sides then traded possession and territory as the defenses held strong. Clayton finally broke through with a powerful run as the third Doyle brother, Patrick scored to cut Gaston’s lead to 19-17 with about fifteen minutes to play. The lead then swung in favor of the Bootleggers as prop Andrew Jones crashed over for a short range try to give Clayton a 22-19 lead with less than ten minutes to play. The try was Jones’ first career try. Undaunted, Gaston County worked their way deep into Clayton territory and retook the lead 24-22. The Bootleggers spent the final minutes of play camped inside of Gaston’s 22, but were unable to cross over for the winning score. The Clayton 1st XV and 2nd XV are back on the road this coming weekend as they head west to take on Triad on Saturday. Another important Carolinas D3 match up for the club’s 1st XV while the 2nds aim to continue their progress.